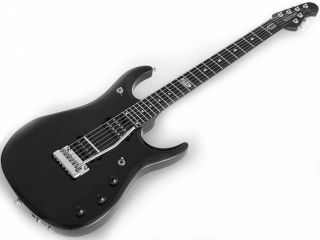 NAMM 2011 PRESS RELEASE: Continuing the tremendous success of the JPX, Ernie Ball Music Man introduces the latest evolution in the John Petrucci line of signature guitars. The JPXI is the newest collaborative effort between John Petrucci and the Music Man research and development team. The JPXI features a combination of top appointments from JPX and BFR Petrucci signature instruments. Most notably, the JPXI neck has been streamlined to a symmetric, extra-slim profile featuring a flatter 20" radius, medium jumbo stainless steel frets with a finished mahogany neck and an ebony fingerboard. Combined with a solid alder body, mahogany tone block and maple top, the JPXI has become the ultimate rock machine. Similar to that of the JP BFR line, controls include two three-way toggles perfectly wired for the Custom DiMarzio LiquiFire and Crunch Lab humbuckers, in addition to a redesigned Wide-Spread Pivot tremolo with a Music Man/Fishman piezo system bridge pickup. Information taken from an official press release. For more, visit Ernie Ball.